The C&S Woodpecker Treat Premium Suet Cake provides woodpeckers and other wild birds with a high energy feeding option. This suet is made from a premium blend of nuts that woodpeckers crave. Suet is a high-energy formulation of animal fat that is traditionally used to attract birds that do not normally come to feeders, and is an excellent substitute for insects many birds feed on that are not plentiful in cold weather. This suet cake will attract woodpeckers and other neighborhood birds that love to eat an exciting blend of nuts. The Woodpecker Treat Premium Suet Cake is the perfect nourishment for high metabolism woodpeckers. Made in the USA. 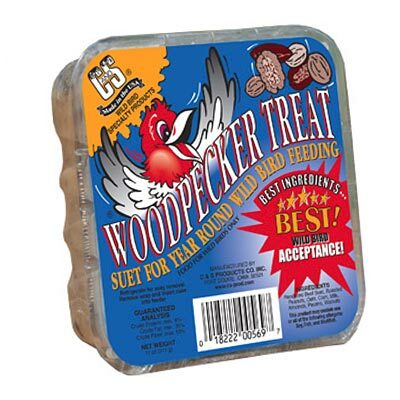 Note: This case pack includes 12 C&S Woodpecker Treat Premium Suet Cakes.